Just because I love grease, doesn’t mean that I don’t love sparkly things too! Before going to Viva Las Vegas this year, I wanted to add a little bling to my 1955 Studebaker Champion with a metal flake paint job. Studie and I have been through a lot together in the five years I’ve owned and drove her. I’ve become attuned to her original patina’d coral and white paint job. So originally the thought of changing her exterior in any way made me nervous. But the more I thought about adding a subtle sparkle to Studie’s white roof portion, the more I liked the idea. Not knowing the first thing about how to paint, I was lucky to have an expert nearby. Pati Fairchild is the newest member of my car club, the Gasoline Girls. She also happens to be a professional paint and body chick who teaches the subject at El Camino College. After polling friends on Facebook and looking through various paint samples, I paid a visit to Coast Airbrush in Anaheim for my final selection. 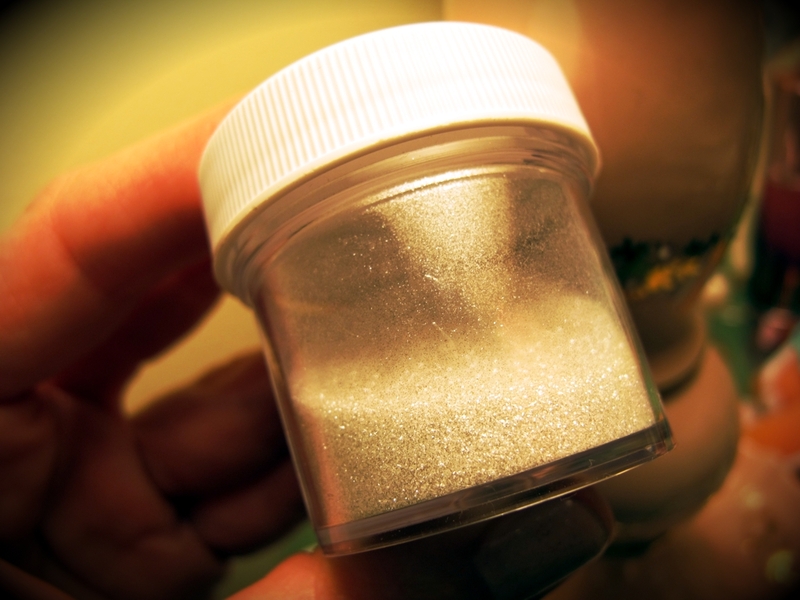 I went in knowing I wanted an abalone sort of flake that would disappear in the shade but be super sparkly in the sun. The friendly guy at Coast Airbrush highly recommended the House of Kolor Ice Pearl Flake. I’d had a little experience with Ice Pearl before. Co-Gasoline Girl Lori’s F1 is covered in ice pearl over bare metal – and it’s a crowd stopper at every car show we attend (as you can tell in the picture above!) After being blinded by the sparkling white ice pearl in the sunshine, it didn’t take me long to decide it was the way to go. We ended up doing three coats of White and Red House of Kolor Ice Pearl flake mixed into clear, covering that in two coats of plain clear – for a total of five coats. 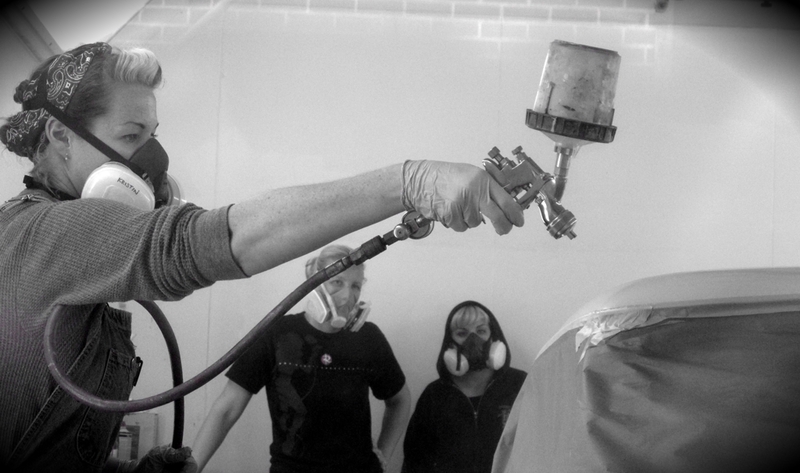 Pati showed me how to spray as she did the first coat and then I grabbed the gravity feed gun for the last four. Gun in hand for the first time, I was a little nervous about how to paint. Keeping in mind that Pati told me to spray even and steady, I quickly found a rhythm. The ladies said I looked like a pro. I’ve gotta say I’m looking forward to my next chance to paint! 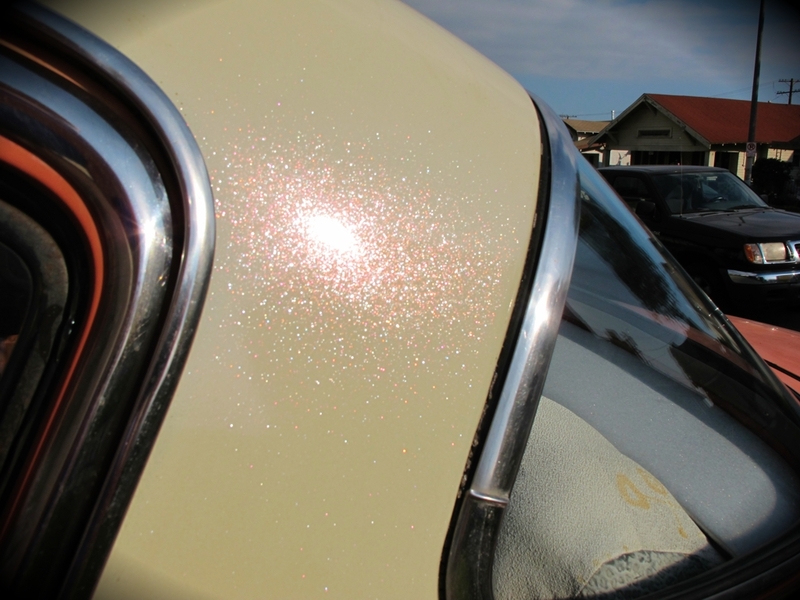 The Ice Pearl Paint sure does sparkle when the sun hits it right! Although ultimately I might want a heavier metal flake, I think the ice pearl flake was a great decision. 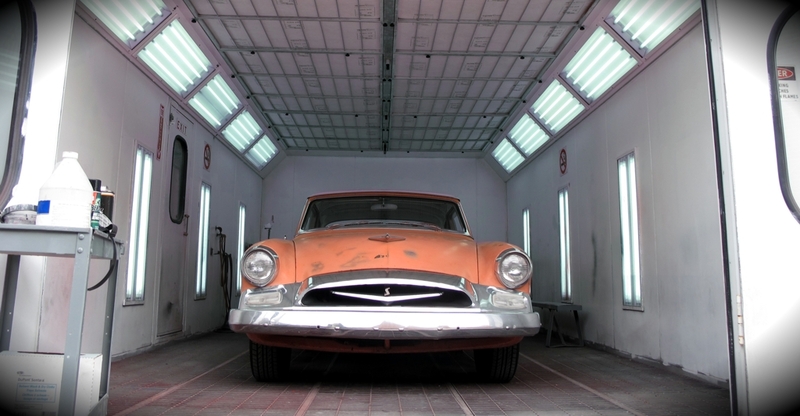 It kept my patina’d roof looking just like it always has…but when the sun hits it, watch out! I’ve still got a ways to go before giving Stude the real body attention she needs. But until then, she’s got a little sparkle inside and out…just like me! 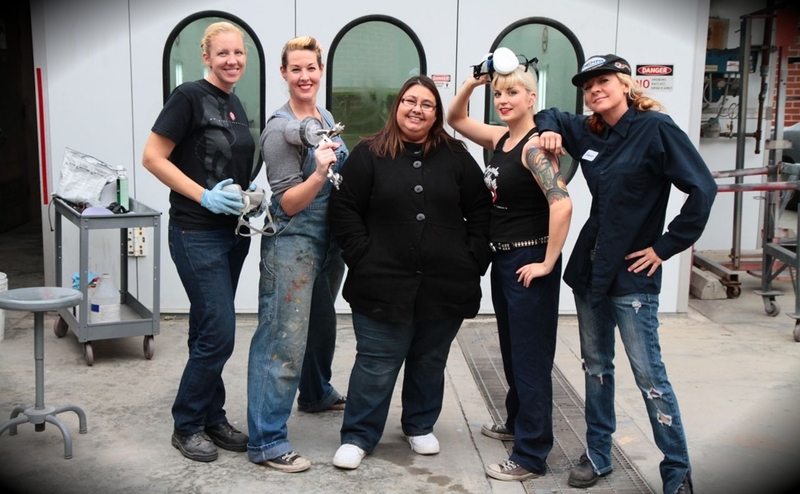 Many thanks to Pati Fairchild, El Camino College, and the Gasoline Girls! If you know of any young ladies interested in car careers, check out El Camino College’s Women in Technology Program! Nice job! Kind of reminds me of those motorcycle helmets from back in the day! Also, I never saw anything like your friends clear over bare metal before, cool! I wish i know some girls interested in old school rides like You. I love the 60s Metal Flake style. Love the look been painting for over 40 years getting ready to do a large gold metal flake job on my 62 year old brothers ford ranger with shell so it will be a lot of spraying. Did motor cycle flaking in the seventies definately much easier today. 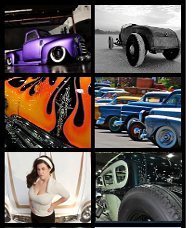 Lovin the flake on bare metal idea….sounds sweet! Great to see us girls are starting to get a name for ourselves within this mainly male dominated industry……I’d be highly interested in goin to your college…if you were in Australia!!!!!! Fingas crossed you might make a special visit down here for a while to maybe hire out some “classrooms” and teach us aussie chicks a few things!! !